We believe everyone should be able to use their gifts and talents to participate fully in the body of Christ! Is there a way that we can assist you in your visit to New Life Presbyterian? Hearing Assistive Devices are available from the ushers, as are large print bulletins. We have door activation switches on the main entry, cutouts for people in wheelchairs in the sanctuary, a ramp to the chancel and an elevator to the music rehearsal spaces in the basement. In addition to wheelchair accessible stalls in the main bathrooms, we have a wheelchair accessible companion bathroom. Communion includes choices of grape juice or water and regular or gluten-free bread. 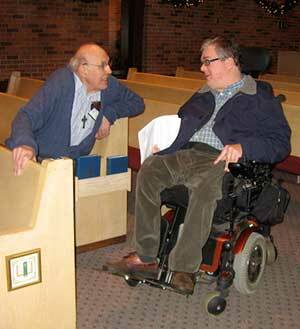 Read this article from Presbyterian Today, which highlights how New Life's commitment to accessiblity began with the former North Como congregation.